Concrete Cutting Services involve a wide variety of individual techniques to shape hardened concrete, asphalt or stone. These include sawing, drilling, grinding and polishing. Within each of these there are a variety of specialised techniques to achieve the required outcome. Here we list in one place the 4 main types of concrete cutting services and techniques employed by experienced and professional concrete cutters to achieve a quality result safely and quickly. A track mounted wall saw preparing to cut into a brick wall. Using a high powered hand saw with a diamond tipped blade this is the most versatile way to cut through concrete. 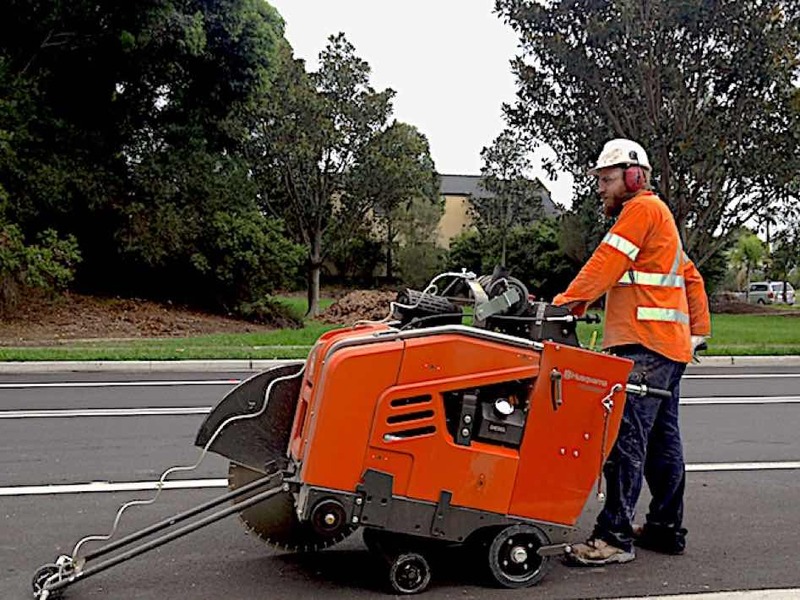 A skilled operator can cut through slabs, cut trenches, cut through kerbs for driveway openings and most other tasks where absolute precision is not an essential requirement. Similar to hand sawing, slab sawing is designed to cut opening in concrete floors in houses, office buildings and patios. It even includes roadways and residential driveways. 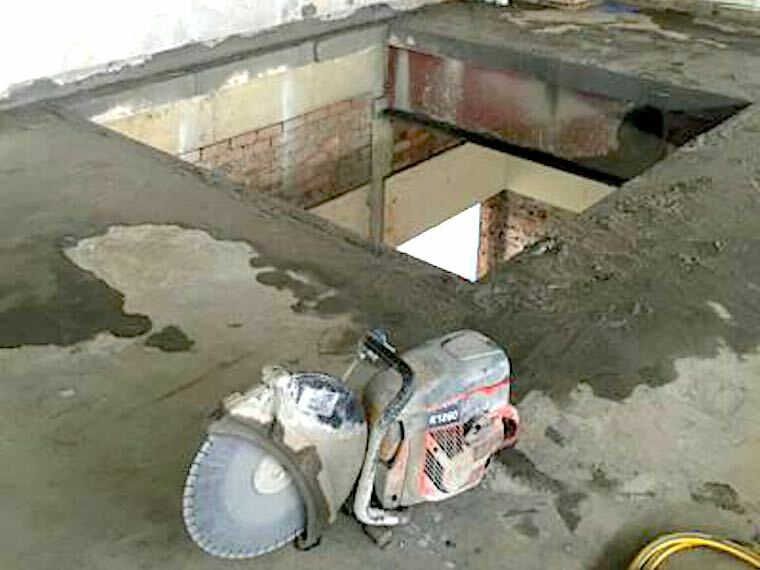 Slab sawing can be done both inside and out for creating electrical and plumbing trenches or overhead for air ducts, even elevator openings. Where a precision cut is needed at any angle a wall saw is the most effective option. 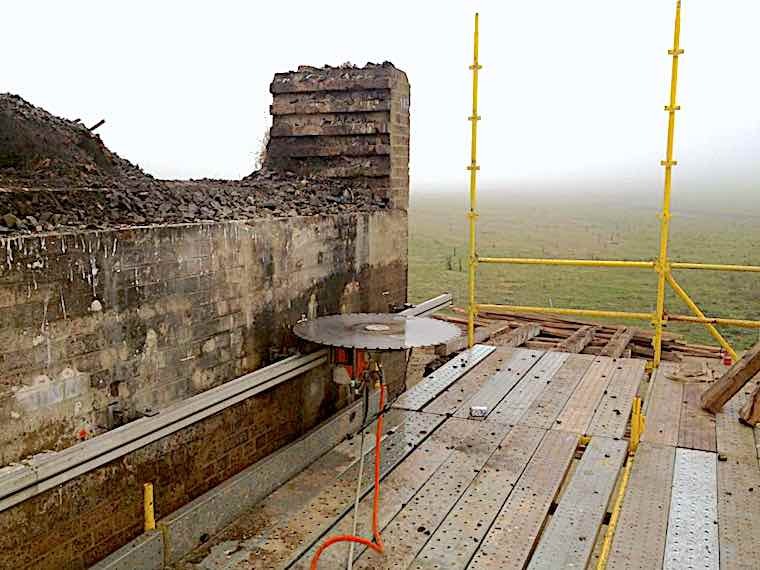 Wall sawing involves rigging a specialised concrete saw to run along a track mount. This track mounted wall saw can cut an opening for doors and windows through brick, cinder block or reinforced concrete. This technique allows us to cut an opening that runs flush with the wall or floor. One of the more unique concrete sawing techniques in the industry. A diamond coated wire is wrapped around the concrete object to be cut and the wire is run back and forth across the concrete surface until it eventually cuts all the way through. This is the best solution for irregular concrete objects such as concrete pylons or even bridges. It can often provide a suitable alternative to hand and wall sawing when the object is too deep for a conventional saw blade to cut through. One of the more popular commercial applications is road sawing. For cutting openings for electrical or plumbing services underneath roadways or simply removing a section of road altogether. A road saw is a large machine, often diesel operated which has the operator control it by walking behind it. 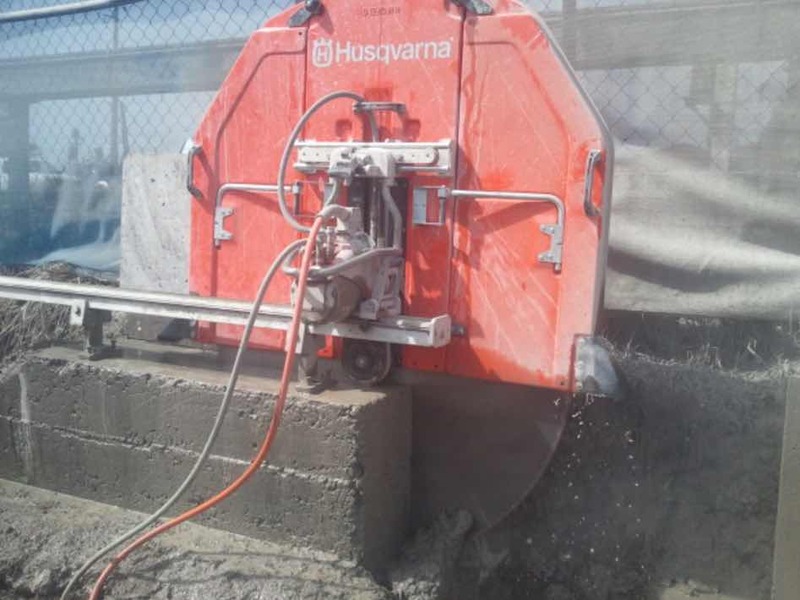 See more on our concrete sawing services and get a quote. A concrete core drill. With stitch drilling overlapping holes can make all manner of shapes. Core drilling is used to cut a hole in brick or concrete walls or floors to allow the passage of plumbing pipes or electrical conduit. It can even be used to remove anchor bolts set in the wrong position. A core drill as the name suggests is a metal ring which cuts out a core of concrete from the surface rather than drilling away the entire concrete material. The diamond coated drill bit actually grinds away at the surface and the drill is most commonly mounted in position to achieve a straight and true core hole. Stitch drilling uses a core drill to achieve a similar result to that of a concrete saw. A concrete saw is limited to a straight cut and a certain depth (often around 750mm). 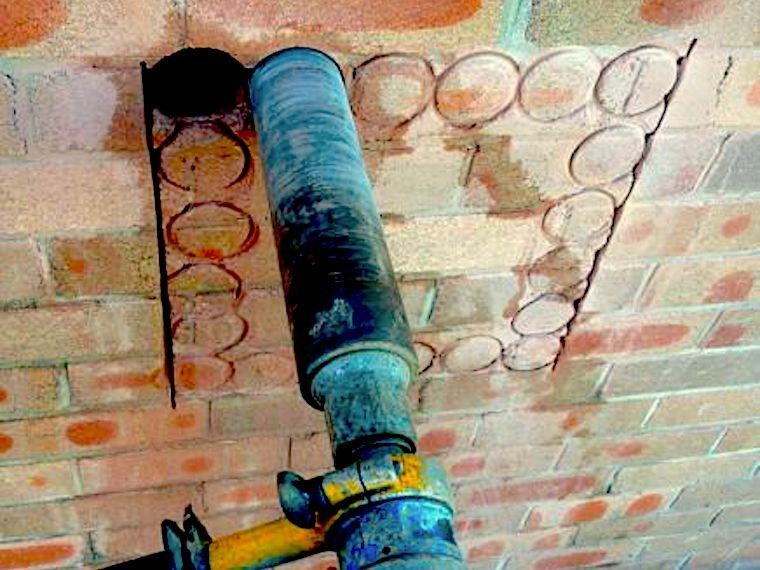 Successive concrete core holes drilled next to each other can cut a hole to any shape and to a depth of over 1m. It is also used to cut a clean corner of a square opening where a concrete saw will overrun the line. See more on our concrete drilling services and get a quote. 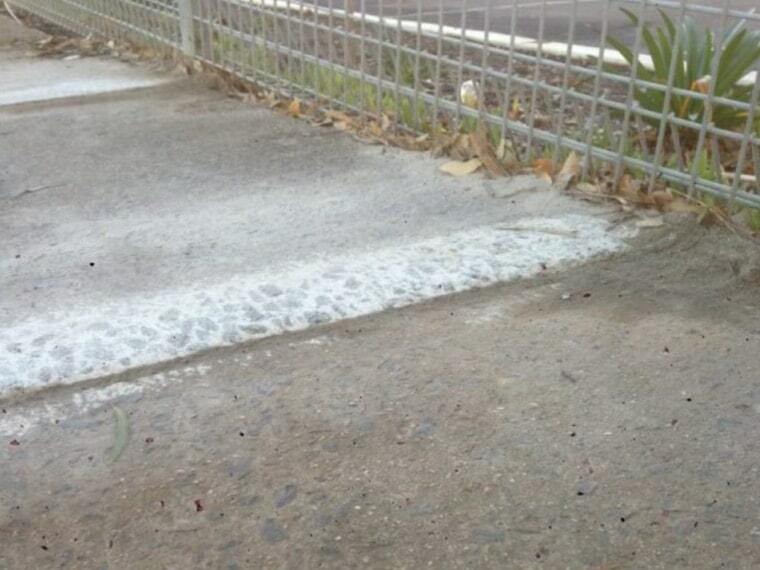 A concrete footpath showing the results of concrete grinding to remove a trip hazard. To avoid trip hazards on pathways where the ground has shifted due to erosion or tree root growth. Concrete grinding is like a grass mower and can run over the uneven edge until the surface is level. It uses tungsten rings than spin against the concrete surface and the dust is extracted and stored for safe disposal. When preparing an old concrete floor for resurfacing with tiles or polishing, a concrete grinder will remove any paint, glue or any irregularities in the surface to create a smooth even finish. This allows the new surface material to be applied to a clean level surface. To create an exposed polished concrete floor, once a concrete grinder has been applied, a concrete polisher works like sandpaper and uses a diamond coated polishing wheel to apply numerous passes of ever finer grades of diamond grit. The finer the grit the shinier the floor becomes. Many people seek a polished floor for aesthetic appeal. It is best to get a qualified assessment before you invest in a polished floor as it can be expensive to get a super shiny finish and any imperfections in the concrete will come out more visibly. See more on our concrete grinding services and get a quote. Now you are more informed about the types of concrete cutting services that are available to you. Rather than attempt these specialised techniques on your own, requiring specialised equipment, it is best to consult with a professional.